Today we have Bonnie Olaveson of Cotton Way blogging for us! She is the sweet, nice, talented designer behind all of those fun Cotton Way patterns, including a series of table toppers that we love! Read on...and talk about a love of quilts and design that spans generations! Click here to see more pictures of her beautiful family. I am really a novice at the blogging thing, but was excited and honored that Kimberly would ask me to write a post for the Jolly Jabber. Things have been crazy around here since Quilt Market! I spent the summer designing my new Table Topper of the Month series plus 4 new quilt patterns. I must say that I am happy (and quite relieved!) to have all 16 new patterns ready to go and hope some of you out there will enjoy making them. A little about me and my company. I started Cotton Way in 1990 and can't believe it has been almost 18 years of designing, cutting, sewing, writing patterns, Quilt Market and lots of late nights. As many of you may know I designed dolls for the first 10 years, including a series of dowel legged dolls called Long Leggins. Keep in mind this is when dolls were all the rage! Now I am really enjoying designing quilts. My favorite at the moment is my new Dot-To-Dot quilt. Inspiration comes from many things, but a lot of times it comes from events in my life such as weddings, grandchildren, graduations, birthdays, etc. I also love to look at decorating magazines for new colors and trends. Chocolate is a must in the designing process! I'll admit it, I am completely hooked on M&Ms. When I am not busy designing, I have a husband, five children and five adorable grandchildren that keep me very busy. We enjoy spending time at the lake in the summer, and here in Idaho we have lots of snow in the winter to snowmobile and play in. Occasionally we take a trip or two and are planning a trip to South Africa this February. I love to decorate and re-decorate my home, and typically take on way more projects than I can finish. A few other favorites: the color red (can't get enough of it lately! ), taking pictures of my family, scrapbooking and the beautiful view from my sewing room. As long as I'm not cooking or shopping (except for fabric of course) life is pretty good. I am excited to have my daughter Camille join the world of quilting as she is the fifth-generation quilter in our family and now a fellow Mom-trepreneur. I have warned her at what a crazy life it is, but then she never did listen to her mother! When she was in the 3rd grade she wrote a paper about taking over Cotton Way when she grew up and now she has a company of her own. She is very talented and I wish her the best with Thimble Blossoms. Also, my youngest daughter Emily designed one of my new patterns Emily's Garden in Blossom. She is only 15, so it has been fun to see my girls get excited about sewing and hope they will pass on the quilting gene. 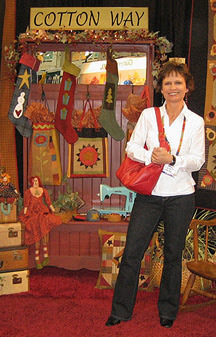 It is amazing to see how the world of quilting has changed and what new and exciting things are out there. Keep an eye out for the updated Cotton Way website and a possible blog in the near future.